Eighteen-year-old Cody Simons considers himself extremely blessed to have grown up in a loving home where all his needs were met. That’s one of the reasons giving back through local non-profit, faith based charity, Cornerstone Foundation is so important to him. “God has always put a calling on my heart to serve others before myself,” said the engineering student at The University of New Brunswick. “Over the years, I’ve been on two mission’s trips – one to Honduras and one recently to Kenya. 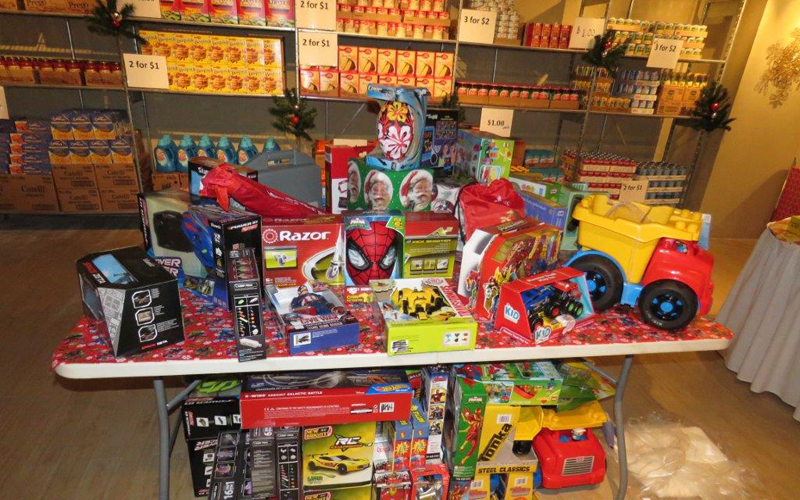 One way he gives back during the holidays is through Cornerstone Foundation’s Annual Christmas Store. More than 140 local families benefit each year through the initiative, which has run successfully since 2012. It offers hardworking parents the chance to buy toys, gifts, household supplies and food items, in a Christmas themed environment, for up to 90 percent less than what they would normally pay in stores. For those struggling to make ends meet, they leave with a sense of hope and dignity, having made choices that work with their budget. Last year’s event saw more than 80 volunteers lend a hand to make the shopping experience a success; handful of generous community and corporate sponsors also jumped on board to donate financially to this initiative. “For me, my favorite part about the Christmas Store is seeing the smiles on everyone’s faces because it shows how grateful they really are. It also reminds me of how not to take anything for granted,” Cody said. While parents shop, children are entertained by volunteers at the arts and crafts station. Cody admits it’s one of his favorite parts – hearing young people’s stories, yet seeing how they have remained positive and in good spirits. “I think programs like these are important because you are able to give to the community in ways you never thought possible and it shows others what service really looks like,” the teenager said. “The gesture doesn’t have to be big, but if it comes from the heart, then anyone will be able to see and feel that. Cody has seen countless families blessed in one way or another through the Christmas Store. In addition to discounted goods, there are also giveaways up for grabs, including grocery and electricity vouchers and turkeys for the holiday. Cody encourages anyone who loves to volunteer, to get involved with the Christmas Store, happening this weekend – on December 8 and 9. Cornerstone Foundation is looking for additional partners in this vision, so they can give as many families as possible in our community a ‘hand up’ and the gift of dignity during this holiday season. Cornerstone Foundation is a registered charity.